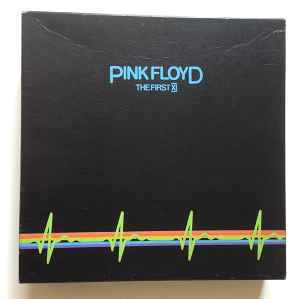 This is the original Pink Floyd 1st XI Box Set of 1000 copies only from UK Harvest PF 11.Contains the first 11 releases on Lp from Piper At The Gates to Animals but both Dark Side Of The Moon and Wish You Were Here were made as unique Picture Disc releases.The original black box with Dark Side Of The Moon motif around it differs totally from the later releases with a similar name.This box set was released in 1979. I purchased my boxset in 1981and it didn't have the picture discs . Why there are UK boxes with regular Dark Side of The M0nn and Whish on black vinyl? And not listed in Discogs? Absolute rubbish about Animals and 1979 release.This may be so for a later issue but the ORIGINAL first issue of this box set was released in 1976 without any Animals LP and no doubt before it was released.I got a copy on release in 1976-the whole idea was a 'skit' on the 1st XI football thing and my copy which was a pre release copy had the 1st XI little booklet with the PF football team at the front and a list of the LPs included-I haven't got it at hand but am sure the last release is Wish You Were Here-any 1979 release was a later issue OR a completely new release.I was a very avid Floyd collector then and there were a number of new box sets around that period but not this one. The other fact is that the 2 Picture Discs that came with the first 1976 box set did NOT have UK Harvest catalog numbers as above.Both had their own unique catalog numbers and may have been pressed seperatley in the Netherlands.